Look for Royal Avenger at the Breeders Edge Auction in August! Jolie is a very dense and solid production female. She comes from nice bloodlines with both parents being Peruvian imports. She carries a soft fleece that is holding its fineness well. Her conformation is wonderful, and her large heavy frame will serve her well as she ages. Jolie gave birth this year to a beautiful female cria, unassisted and she had plenty of milk. Since we acquired Jolie at the Peruvian Classic sale a few years back, she has never been the type of alpaca that wanted much hands on attention. Although I can halter her without hesitation, and she leads well, she is still the first one to "high tail it out the barn door" as soon as she sees "humad-kind" coming. Jolie likes to keep her distance that is for sure. I am able to give her shots with just one helper, and I am able to cut toenails too, but kisses ... forget it ... Jolie is not going to stand for that! Her cria is a sweet looking cria out of SA Accoyo Royal Avenger, and she is quite a little beauty. 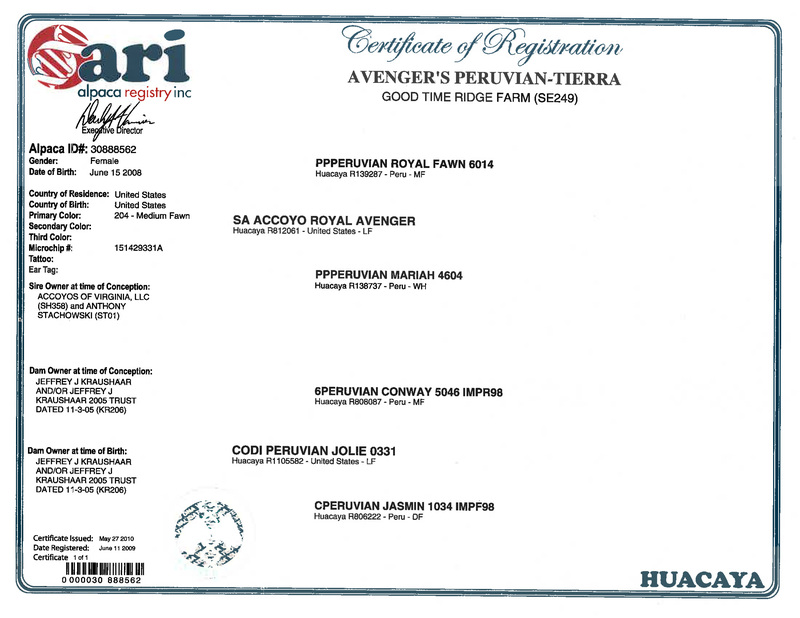 As the daughter of Peruvian Avenger, Tierra has a striking resemblence to her sire. She has a perfect alpaca phenotype, square build, full topknot and full-fleeced face. Her legs are perfectly straight and covered with full, dense fiber. She is heavily boned and has a nice wide chest, showing that someday she will be able to carry and produce many crias for her new owners. She is a strong framed female with a feminine look. Once inside her fleece, you will see the lovely character that goes from skin to tip. Her staple length is very impressive at this point too, along with such a buttery feel, we know her micron count must be in the teens. Her fleece is consistant from shoulder to rump, and the crimp continues from the topline all the way through her belly. First show in full fleece, Michigan, she took a 2nd in a tough group! Many wonderful comments from Wade on this female. 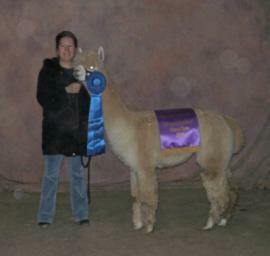 Ohio National Champions Show, Dec.6, 2009, Color Champion and First Place, light fawn/beige full fleece halter! Great quality - full Peruvian! Top knotch bloodlines half accoyo, Royal fawn granddaughter! 25% down 1% over prime for up to 4 years. Other financing terms can be arranged that will work for your budget.